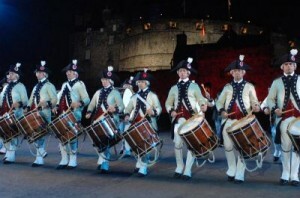 The end of the 2007 Edinburgh Military Tattoo is upon us. We just finished the Friday evening performance to an appreciative audience in perfect weather and have two shows remaining on Saturday, 25 August. I won’t attempt to try to write a review of our time here in Edinburgh, though several MCV authors will post to this blog next week. This has truly been a once-in-a-lifetime experience for all of us. So, what is on tap for MCV at EMT in the next 48 hours? Packing party @ 1:00 am. Sunday: Two-weekers leave for airport at 6:00 am. 4 weekers leave at 9:00 am. We all get back to Boston sometime Sunday evening, and back to our regular lives. Stay tuned for more postings next week and plenty of photos! Only 6 shows to go…. I saw your performance on BBC TV yesterday. Both the music and the drill were very good indeed!